Unlike certain sellers of circuitbent kit, who shall remain nameless, we have actually built a siren circuit from scratch using timer IC's instead of just buying one of those 6 sound car sirens for £2 from ebay and rehousing it in a new box. This results in a far more warmer & more analogue sounding siren than you would otherwise get. 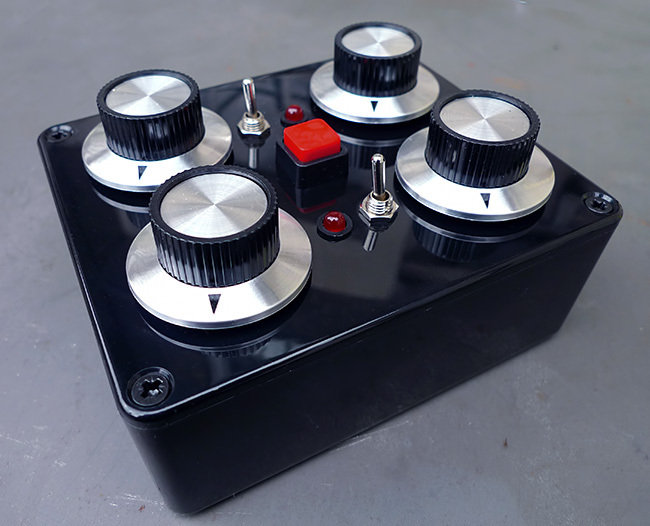 The machine essentially consists of a single oscillator analogue synth with LFO, all controlled by 2 switches, 1 button and 4 knobs. RUNNING SWITCH & BUTTON: The top switch selects between a constantly running siren, and only having the siren running when you press the red trigger button. In either case, whenever the siren is running the top LED lights up. 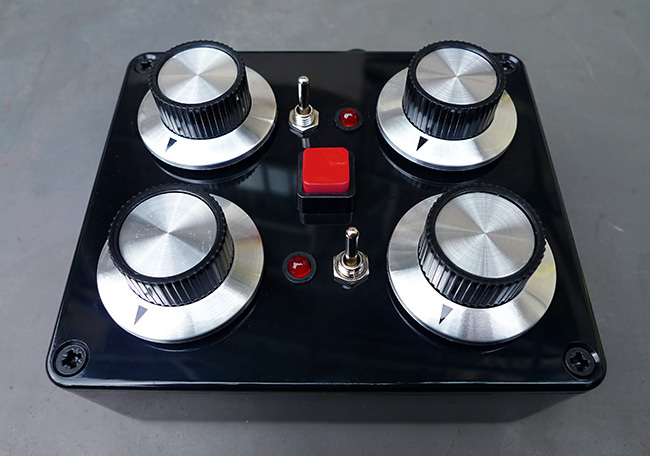 LFO SPEED: This is the bottom left knob. The LFO can run fast enough to produce audio frequencies for some bizarre throbbing tones. 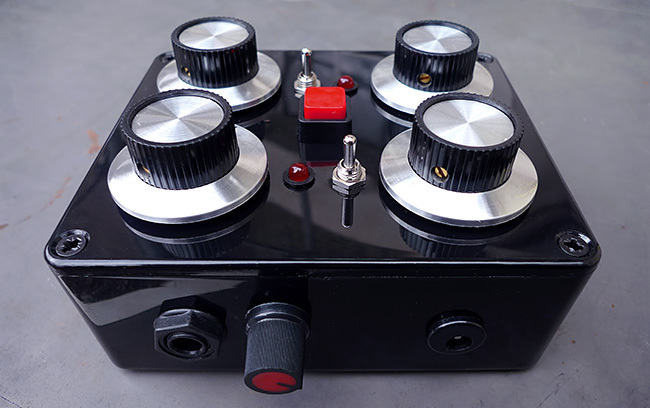 SIREN PITCH: The top right knob controls the pitch of the siren from the bass heavy bottom to ear splitting top end. 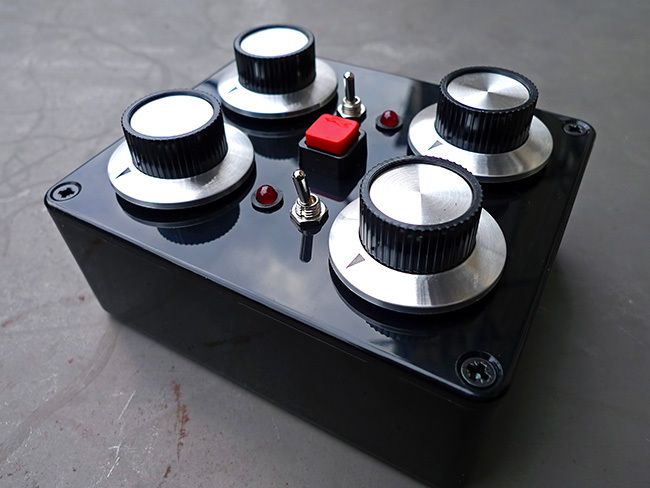 With the LFO depth set to zero this knob will control the pitch of the steady oscillator tone. ALTERATION KNOB & SWITCH: The lower switch turns the alteration knob on and off, this knob performs various functions. When the alteration knob is engaged and fully anti-clockwise the LFO depth knob then controls the LFO waveform shape, smoothly morphing from a squarewave to the normal triangle wave. As the alteration knob i turned clockwise the LFO triangle waveform slowly morphs into a kind of curved ramp shape. The alteration knob also subtley adjusts the speed and depth of the LFO depending on the settings of the other knobs. With some practise this control can produce a very wide range of siren sounds. The machine also features an LED that flashes in time with the LFO sweep and round the back there is a 1/4 inch jack output with an output volume knob. The machine runs on an external 12V centre negative (Roland / Casio polarity) power supply which is not included, but just about any halfway decent supply will do. The default colour scheme is as shown, with red LED's, button and volume knob around the back. If you have any other preferences for these colours then we might be able to make a custom unit for you depending on what parts we have in stock. If we needed to make a special order for different coloured parts then it might be a little more expensive, but get in CONTACT before buying to see what we can do. Click on the player below to hear the kind of sounds this thing produces. There is no external processing apart from a touch of reverb. Below is a new video demo of this siren. Video quality is a little suspect but the audio is recoreded completely dry into a PC with no editing or effects added. If you want to buy one of these units click on the Buy Now button below. Payments are processed via Paypal, but you can pay using a credit or debit card without having a Paypal account. If you want to pay using some other method, please get in touch via the CONTACT page.